Not a lot of change in the large scale weather pattern for the next week We will continue to see fast moving low pressure troughs and frontal systems move across our area every 2 to 3 days. The next frontal system is approaching the coast. 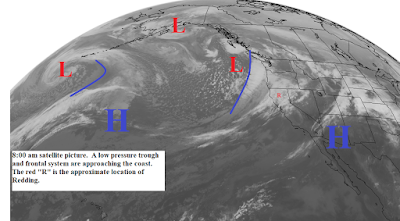 This system will spread light rain over Northern California later today and tonight. The precipitation will turn to showers Thursday morning and decrease during the day. This system is slightly colder and snow levels will drop to around 5000 feet by early Thursday. Gusty south winds will occur this afternoon and evening. Late Thursday afternoon, Friday and Saturday we will see partly to mostly sunny skies with near normal temperatures. 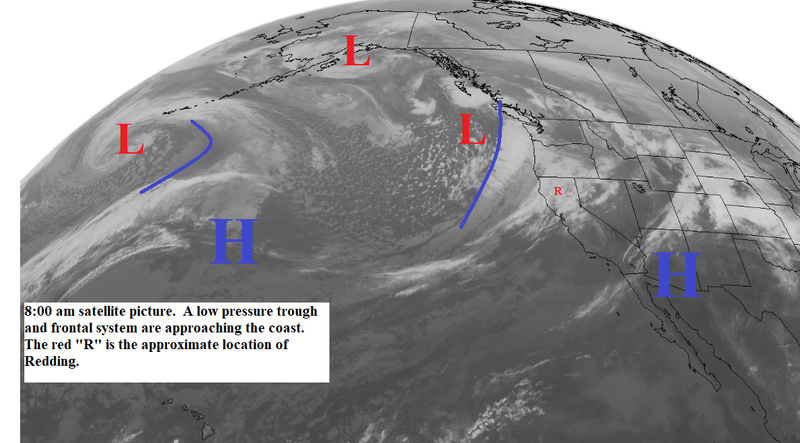 Sunday another low pressure area will be along the coast (see map below). This system will bring rain to the north state Sunday with showers on Monday. Snow levels will start out high but drop to 3500 to 4000 feet in the north by Sunday evening. Tuesday we will have a break and then another low pressure trough will move through Wednesday afternoon and Thursday.